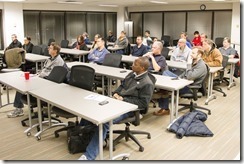 Monday night Co-Founder Brent Stewart delivered a great presentation at the local Kansas City .NET User Group on how PowerShell can improve your daily tasks. He introduced the core concepts of PowerShell and many common uses. 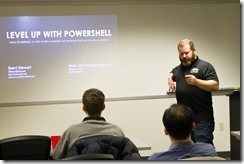 He also dispelled some common misunderstandings about what PowerShell is good for and who should use it. After that he covered the naming conventions of CmdLets and some of the more common commands you will encounter. Then he went through a series of exercises showing the basics of scripting useful utilities developers can do with PowerShell. The talk was very dynamic and Brent kept the user group entertained with his wit and engaged in the talk, providing many opportunities for audience participation. We love working with the user group as Co-Organizers with Lee and John but it is always a good feeling when we get to also have the chance to share the tips and tricks we’ve discovered over the years with our peers. Slides and code samples from his talk can be found here.